Rajasthani Hari Mirch Ka Maas is a pungent, filling accompaniment made from mutton, onion, garlic and curd. Serve it with Roti! Here is a video recipe to make it. Rajasthani cuisine takes me closer to my roots. Having stayed in this golden land for quite some time, my love for anything and everything associated with Rajasthan has no bounds. Often during Diwali, when the family has got together, I surprise them with traditional Rajasthani dishes like Rajasthani Pitori ki Sabzi, Rajasthani Mawa Kachori, Rajasthani Ram Chane, Rajasthani Laal Maas et al. And, my family cannot stop licking their fingers when served these delights. To update the collection, I have recently made Rajasthani Hari Mirch Ka Maas which has literally become a hit as well. Infact if you want to try one Rajasthani dish, this should be it. 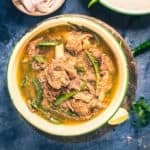 Rajasthani Hari Mirch Ka Maas is a pungent, filling curry made from mutton, onion, garlic, curd and lots of green chillies. It is one of those recipes which was prepared during the rules of Maharajs. During the hunting trip, the ingredients carried by the Kitchen team were limited and hence these simplistic dishes using minimum ingredients were discovered. Unfortunately, Rajasthani Hari mirch Ka Maas is getting lost with time and only a very few people still make it. 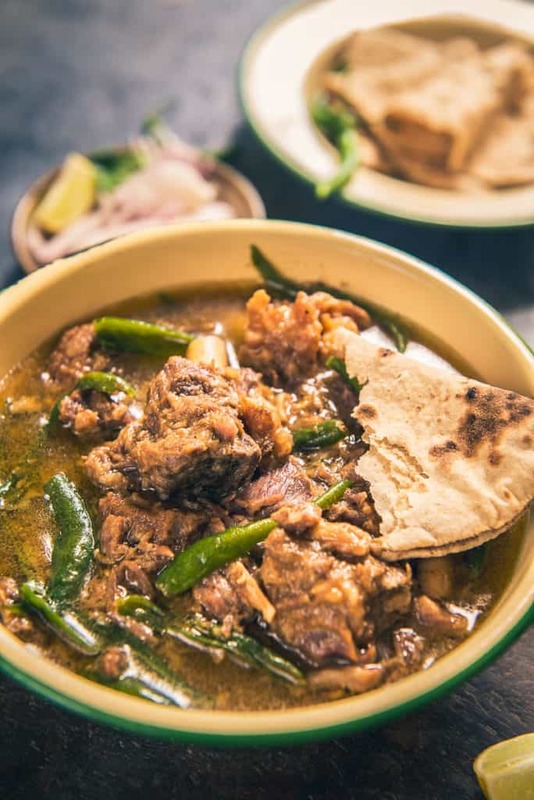 I remember my Dada Ji talking abut this recipe and a few times, my dadi made it when we were visiting them and so I had a fair idea of the taste and keeping that taste in mind, replicated the dish and trust me, I have not had a Mutton dish better than this. I am still wondering what took me so long to try this one out. 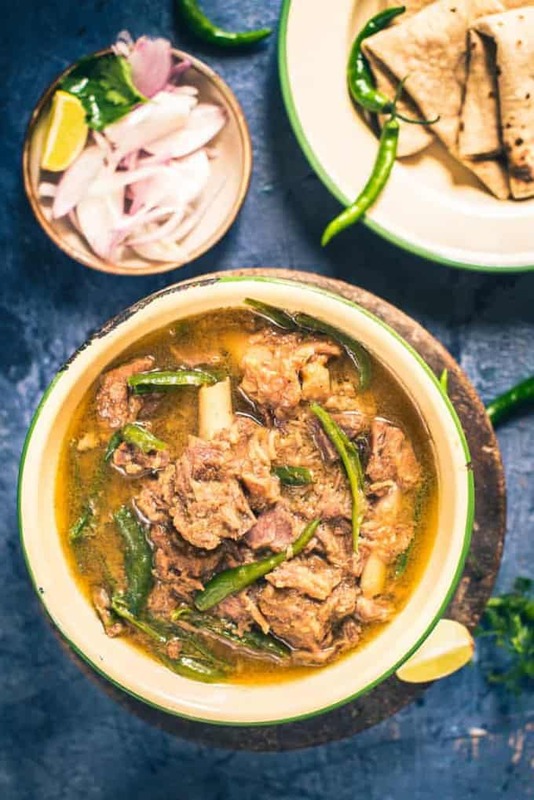 Firstly, for preparing Rajasthani Hari Mirch Ka Maas, the mutton is marinated using curd, lemon, spices and then it is pressure cooked till it turns all delish! 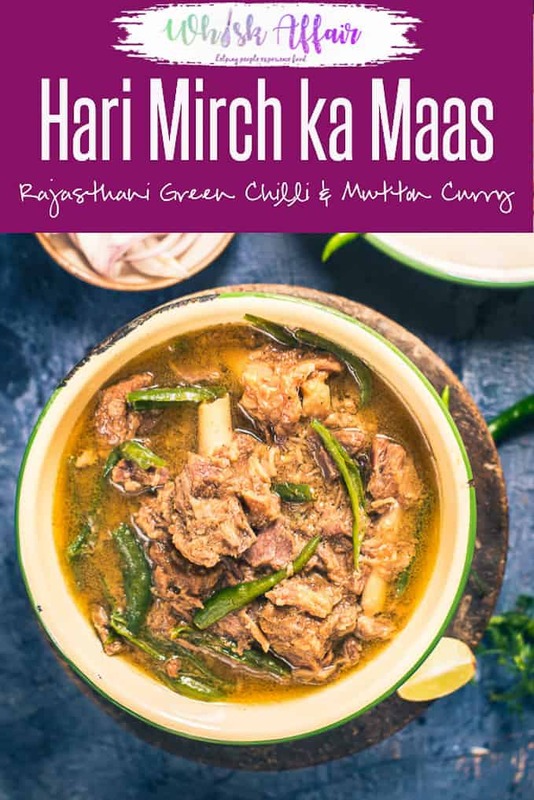 It is an underestimated joy to eat Rajasthani Hari Mirch Ka Maas as it has the rich taste of spices as well as the goodness of luscious mutton. Rajasthani Hari Mirch Ka Maas can be eaten with rice or roti as well. So, with festive season coming up, prepare this desi delight for your loved ones soon and at once feel like you are in Rajasthan! Rajasthani Hari Mirch Ka Maas is a pungent, filling accompaniment made from mutton, onion, garlic and curd. Serve it with Roti! Add mutton, curd, lemon juice and salt in a bowl and mix nicely. Cover and keep aside to marinate for 5-6 hours. Add garlic and ginger and fry until union turns golden brown. Now add the marinated mutton along with the marinade and cook on high heat for 3-4 minutes. Add 1/2 cup of water and pressure cook until mutton is cooked. Add green chillies and cook for another 3-4 minutes. I went through your recipe and was wondering where is the Rajasthan spices in this preparation. This is basic Mutton Masala or gravy which is made is every state and household. Sorry to say but I was disappointed to see this. Hello Issac. Rajasthani cuisine is much more than the spicy curries. This particular recipe is a lost recipe and was made during the times of kings when they went hunting with the minimum ingredients they carried. I have done enough research before posting the recipe and I highly suggest you try it out. It is way different from the Mutton Masala or Mutton Gravy that you would have tasted ever.